Shogun Trading's approach can benefit all stock traders, from day traders to long term swing traders. We are proud to show some of the best Performance in Day Trading, Longer Term Swing Trading Strategy, Systemized Swing Trading and through our Educational Courses and Videos... » Get More Info Now! COST has gotten a big breakout move through a clear upper trend line via a breakaway gap and increased volume at 51.00. Look for continued overall strength out of this pattern. FRK is getting a solid breakout from a clear consolidation at 40.00, which is quite bullish. Look for continued strength out of this pattern. Developed by Tom Demarker, the Demarker Indicator is an oscillator which identifies risk areas for buying and selling. It is an attempt to overcome the shortcomings of classical overbought / oversold indicators, making price comparisons from one bar to the next and measuring the level of price demand. Leonardo Fibonacci da Pisa was a thirteenth century mathematician who (re) discovered what is today known as the Fibonacci sequence. Adding 1+1 and then continuing to add the sum to the previous number will arrive at this numerical sequence. The sequence gives rise to the following numbers: 1, 1, 2, 3, 5, 8, 13, 21, 34, 55 and so on. - Dow gets big breakout from consolidation range, rallies to the Close. The index eventually closed the day with a solid 96 point gain, but could be headed higher still. - The NASDAQ and S&P each got solid breakouts from their respective consolidations. Look for continued overall strength, especially should continuation patterns form in the process. The Dow closed out the day with a solid move higher to the Close to cap a highly bullish breakout from the tightly-wound consolidation. Look for continued overall strength to 12,050 in the near-term, especially if the Dow continues to hold above 11,900. If you had a stock trading method that let you discover when a stock was about to make a massive move UP or DOWN, and then showed you, step-by-step, how to take advantage of that move to potentially pull profits out of the markets... would you be interested? The "sweet spot" of Quantum Swing Trader is that it shows you how to take just a few common indicators, but use them in an uncommon way to "pinpoint" the spot in any stock where it has a high probability of making a massive move UP or DOWN, but not stay the same. When is a Trend Truly Broken? The importance of trendlines cannot be overstated when it comes to technical analysis. We are told to trade with the primary trend, exit when the trend reverses, enter on trend reversals, and so on. Trends are easy enough to identify, but when is a trend actually broken? BCE took a large gap up today, but immediately began to fill the gap on high volume. This could be our first indication of a potentially bearish exhaustion gap or a potential volume climax, both of which indicate potential selling ahead. Watch 28.00 for signs of continued weakness. 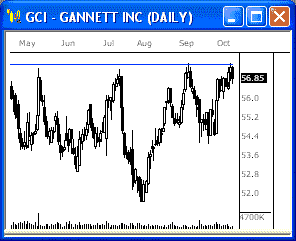 SGTL is challenging the upper trend line of a clear triangle consolidation that could send this index much higher. Watch for follow-through above 5.25 for signs that we could see movement back toward the 8.50 range. - Dow remains within key consolidation range, continues to build toward breakout. The index closed the day with a very volatile sell-off and recovery, and eventually ended with a 15 point loss. - The NASDAQ and S&P each pulled back from early highs to further define the large consolidation ranges. Look for further range movement until a solid breakout is seen. The Dow continues to trade strictly within the boundaries of the clear consolidation, which we will continue to watch closely. A breakout from this range will finally spark key movement in the next day or two. A complimentary trading gift for you that you probably won't see anywhere else. Access the QST's Profit Feeder Members Website Preview - FREE Tryout! Take a preview of what is already being called one of the best and most complete stock trading courses ever released to the public. Everything about it is first class... and easy to understand. Next week, on Tuesday, October 17, at 9am eastern time, 200 more copies of 30+ year veteran trader Bill Poulos' Quantum Swing Trader course will be released to the trading community. This is the same course that's already sold out 3 times this year, and this fourth limited release is sure to follow this pattern. Bill's website has received over 20,000 visits in the past few weeks since he first leaked word of this re-release. So to help traders make an informed decision on this groundbreaking course, Bill is tearing open the "digital doors" to his exclusive Members Website Preview for Quantum Swing Trader. ** QST Video Trading Vault: Get complete access to a library of recent trade videos including actual trades that Bill's students have placed using his course. ** CD-ROM Previews: Get an up-front and personal preview of each and every CD-ROM included in the Quantum Swing Trader course. You'll see exactly what appears on your screen as a student. ** Manual Preview: Get a taste of Bill's teaching style with a digital preview of the Quantum Swing Trader manual. This is the same manual that arrives in full color on your doorstep when you become a Quantum Swing Trader student. That may be what you thought when you read the subject of this email. Well what if I can prove it to you. This system isn't called the Pretty Good Trading Machine, or the Great Trading Machine, no. It's called the 'Ultimate Trading Machine' (UTM) and it earned that name for one reason, the precise trade setups it identifies day after day. There are currently just two hundred and fifty owners of the system in the world. That's because in our only previous release (which was done exclusively to NetPicks subscribers) we limited the numbers to that amount. We sold out in just a few days. This is the first ever release of the system outside our private list, however it is still limited in scope. We have a few key partners working with us, and if you're not on their list, you won't ever hear about the UTM. It's not in Google, it's not in Yahoo, and you won't find any flashy banner ads all over the trading websites like so many 'other' systems. And one more thing, it will only be available for very short time, and then it will be gone. We limit the numbers, to a select few, otherwise it could possibly affect the markets. What if you knew exactly where to get into a trade, and exactly where to get out. No guessing, no wondering, and absolutely NO fear whatsoever. And, what if each night you could come into the Owners Club (our private community of UTM owners which we'll tell you more about soon) and see video produced for you, going over the exact same trades you took that day. The same trades we ALL took, including the developers of the system themselves. I said at the top of the email I'd show you that we just came off a streak of 17 straight days in a row. Well, let me prove it. Take a look and you will immediately stop doubting what is possible. You'll open your eyes and mind to a non-subjective, straight forward system you can learn in days instead of months. All built around one single indicator. A system called The Ultimate Trading Machine. The Fisher Transform indicator attempts to be a major turning point indicator and is based on John Ehlers' November 2002 Stocks and Commodities Magazine article, "Using The Fisher Transform." EEFT is winding up within the boundaries of a very tight triangle consolidation. A breakout from this pattern could spark big movement. Watch 25.50 up, and 24.00 down. SM has formed an inverted head-and-shoulders pattern off key support at 34.00. An upside break through 37.00 could spark a solid upside move back toward recent highs at around 44.00. - Dow trades sideways throughout session, continues development of consolidation. The index closed another quiet session with a modest 9 point gain, but continues to gear up for a potentially huge breakout move. - The NASDAQ and S&P each traded slowly sideways today, but look to be developing 'topping out' patterns. Look for a breakout from this range for the next big move. The Dow ended the day slightly higher, but continues to hold within the boundaries of the current five-day consolidation. Look for an eventual breakout from this consolidation for the next key move. HOV has formed a large saucer pattern at the lows, which is shaping up to be bullish. An upside break through the lip of the saucer at 32.00 could spark big strength ahead. AMKR has gotten a big upside break through a major upper trend line via a breakaway gap and high volume, which is quite bullish. Watch for a continuation higher through 7.25 for continued strength. A consolidation is a place where buyers and sellers are very closely matched in numbers. As the battle ensues, others notice that the market is consolidating, and begin considering to get on board. As soon as a break from the consolidation occurs, the latent buyers or sellers usually begin taking positions. - Dow continues sideways within tight consolidation, builds toward potential breakout. The index gained just 8 points for the day, but is definitely gearing up for a big potential breakout move. - The NASDAQ tried to rally the broader market today and has only half successful. The index broke out to new highs within the overall uptrend, but the S&P continues to hold within its consolidation range. Look to near-term support for the next key move. The Dow closed the day within the boundaries of the very clear consolidation that has formed at the overall highs. Look for the index to build out this range a bit more before the next key breakout move is seen. Watch this range closely. An obvious bearish signal is when Chaikin Money Flow is less than zero. A reading of less than zero indicates that a security is under selling pressure or experiencing distribution. CPRT is beginning to fill a large gap to the downside on increased volume, which is quite bearish. Watch 28.75 for signs of a continuation. AYI has filled a large gap to the downside on high volume, which could send this stock much lower. Watch 46.50 for signs of continued weakness from current highs. - Dow trades sideways throughout session, continues development of consolidation. The index lost just 16 points for the day, but continues to hold firmly within the boundaries of a tight consolidation that has formed from 11,800 to 11,875. - The NASDAQ and S&P each traded sideways throughout the session to end the day slightly lower. Look for more range movement ahead of the next breakout move. The Dow ended the day quietly lower after trading sideways throughout the session. The index continues to build out a tight consolidation at the highs, which could spark the next key breakout move. Watch this range closely Monday.